Around Mom's Kitchen Table: Legos for Teens and Adults: Great Gifts for Any Occasion! Legos for Teens and Adults: Great Gifts for Any Occasion! Once considered building toys for kids, these days Legos are for teens and grownups, too! You can even join the TFOL (Teen Fans of Legos) or AFOL (Adult Fans of Legos) if Legos are your passion. When you purchase Legos for teens for any occasion gifts, you are giving a tool that is both fun and educational! Teens all over the world have become involved in creating beautiful and intricate designs using their favorite plastic building blocks. 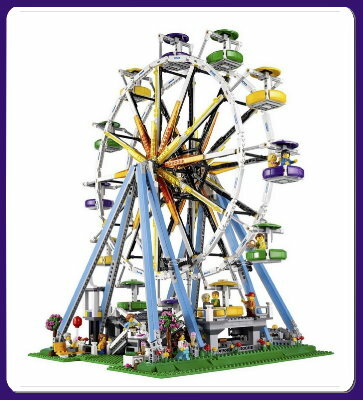 Legos sets such as the LEGO Creator Expert Ferris Wheel Building Kit help encourage teens to use their minds for constructive means, learning to build and create. And now, colleges like MIT are using Legos in their robotics and architectural classes. More and more often, I read of adults purchasing the more expensive sets, such as the LEGO Mindstorms EV3 31313 programmable robot or the awesome LEGO Star Wars Death Star (10188) . These are not only great hobbies but can morph into a job! Consider the sculptors, such as Nathan Sawaya who create life-size statues of people, or perhaps those who built Legoland! 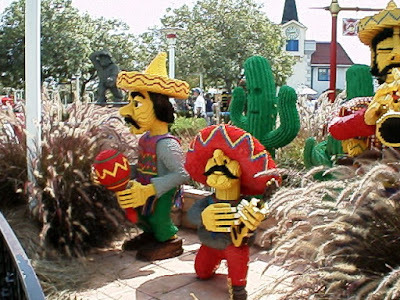 You might visit LegoLand sometime to see just what can be done with Legos. LegoLand - There are even theme parks designed and built with LEGOs! Nathan Sawaya, Brick Artist (TM), was commissioned to build a Lego replica of the flag raising at Iwo Jima inspired by Joe Rosenthal's iconic photographic. With over 100,000 LEGO bricks used in the construction of the piece, it shows the five Marines and a Navy corpsman who raised the flag on top of Mount Suribachi during the Battle of Iwo Jima. The National Museum of the Marine Corps honors all Marines and shares their stories with the American public through interactive displays. Located in Quantico, Virginia, the National Museum of the Marine Corps opened in November 2006. Almost everyone, regardless of age, enjoys building with LEGOs. Artsy.com has even more information about Nathan Sawaya. Teens and adults enjoy creating intricate buildings, robots, towns, ships, trains, and movie models. Lego Lego kits, especially the Mindstorm Creations kits, are now being used in schools and colleges around the world to help teach architecture, art, physics, and even basic programming and robotics. Lego kits are finely detailed representations that will provide hours of fun and recreation for teens and adults. Whether you build them alone or make it a family affair, Legos building sets for teens and grownups are simply fun! Legos Are More Than Toys! These days, LEGOs are much more than toys. The Adult Fans of LEGOS (AFOL) estimates that there are 40,000+ adult LEGO builders, and that number seems to be growing! As a medium, artists around the world are finding LEGOs to be a fun way to create 3-D art. Legos really are for teens and grownups. It really is a worldwide phenomenon. AFOLs members have organized conventions around the world for more than the past ten years. Artisans have created working guitars, roller coasters, entire cities, and warships that actually float. Whether you are musically inclined, prefer to spend your spare time reading comic books, or love surrealistic art, LEGO offers you the ability to build something you can enjoy and be proud of. Be warned, though. Many of these sculptures weigh in excess of 100 pounds. Once you build it, especially if you glue it together, moving it won't be so easy. Best to build it where ever you intend to keep it. Another thing to keep in mind is the cost. Some of these larger sculptures require many thousands of pieces. But who could resist having a fantastic piece of 3-D art you made yourself from LEGOs? LEGOs are the quintessential toy, whether you are 5 years old, 50 years old, or even older. There is no maximum age. LEGOs are for all the young-at-heart! With an ever increasing wide selection of kits, the LEGO company offers hours of enjoyment for anyone who enjoys creating or building. Themed kits, including pirates, carousels, castles, Star Wars, and community sets, supply fun for a wide variety of interests. Many kits for buildings have multiple stories, with lift off sections to see the inside details, while others have three sets in one for even more fun!